If you don't already know, and I know I 've mentioned it about a hundred times lately, I just moved 1300 miles about 2 weeks ago. Why does this matter, you ask. Well, because it's my excuse for using whatever I find in the next box I open to fill whatever need I have at the moment, since it appears that I still can't find all of the things I usually use for those said purposes. So I thought I'd share a couple of little, easy peasy things I repurposed for new uses. The reason I say easy peasy is because all that was required on my part was to clean the item up, put it in place, and fill it up. This is an old baker's bread pan. I forgot I had it actually until I found it in a box labeled "kitchen" that was full of spray paint. Go figure. If you've read about my move, you undastan where I'm coming from. A while back I used to set up at a flea market on a regular basis and I used this pan to display flavored coffees with my company logo that I gave away. I always loved it, just never really knew how to use it. Now I do. It's my breakfast station. Cleaned it up, took off the ribbon and berries and added a great drawer knob I found at a flea market shop. And here it is now, in it's new home, filled with everything I require to get me going in the mornings: coffee, oatmeal, bread and cinnamon. Works perfect. 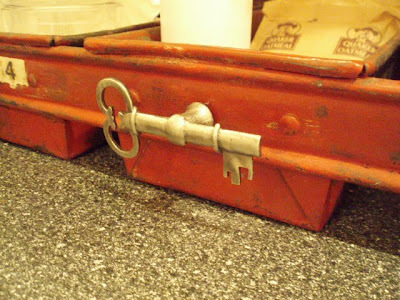 I love those little key handles, so if you know where I can find them in stock, please let me know. I need about 12 of them. I'd say it doesn't get much easier than that, but it does. Read on. One time I was in the parking lot of an antique mall getting ready to go inside when I spotted a woman trying her best to take some windows out of her trunk. 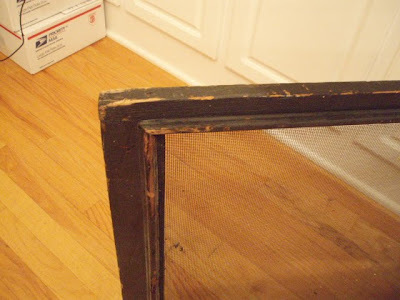 I walked over to help her and discovered that she was a vendor there and was bringing in the windows from her 1908 house that had recently been replaced with newer versions. Uhh, excuse me ma'am, but I'll just take those off your hands right now. So I made a deal with her in the parking lot and I took everyone she had. For 5 bucks a piece. Yes I did. There were 14 of them. In the mix were a few screens that were original to the house. I knew exactly what I wanted to do with those. I knew I could resale all the windows, so I just agreed to take everything. 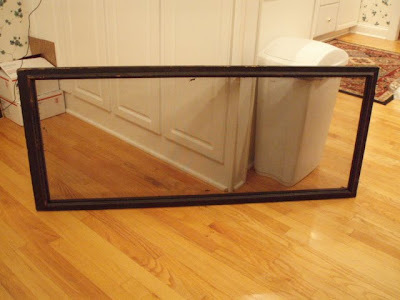 Those of you who DIY understand the little pitter patter of my heart upon securing such a fabulous find, don't ya? And here it is in it's new home. I clip all of my special notes and goodies I've recevied from family and friends. One day I'll read you the notes on here. They are indeed special. 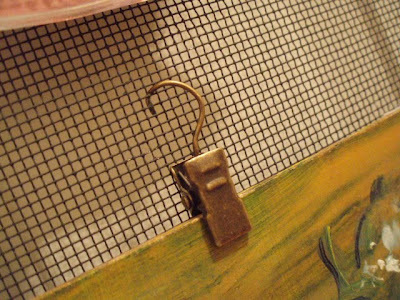 I used the little clips you find on drapery rings to hang things. I just give them a little twist with my pliers so they won't turn. 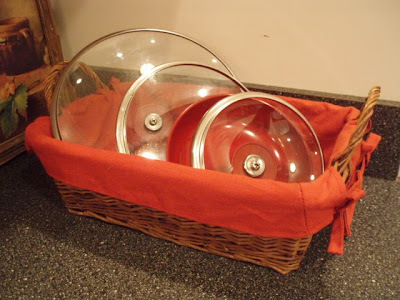 What do you do with your pot lids? It drives me bonky to have them scattered in the cabinet. They just will not stay in place. I usually have a lid holder attached to the inside of my pots and pan drawer, but again, I haven't found it yet, so I needed another solution. I discovered that they worked perfectly in this basket when I tossed them in there to get them out of the way for a minute. Glad I did that. It works and I like it, and it doesn't look messy sitting out on the counter. I've also discovered that I can hide our cell phone chargers in this basket and you can't see them. They're accessible and out of the way. See, you can't see them, can you? They're in there. So there you have it, 'no effort decorating' at The Blair House. What easy peasy projects can you share with me? 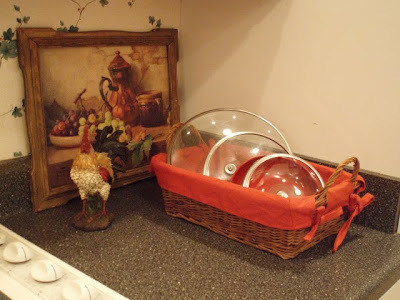 I have the basket/lid thing going, too, except I put it on the shelf in the cabinet where I store our pots and pans. I love that baker's pan and all your breakfast stuff fits in there so nicely! I love how you used the screen and it's a nice thing to see with all the notes on it when you walk by. 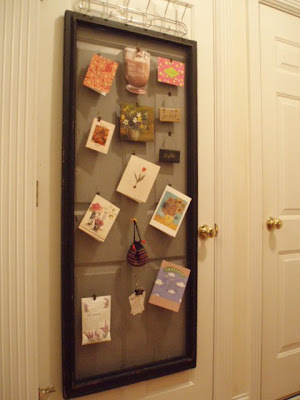 GREAT repurposing ideas!!!! I'll have to see what I've done lately to repurpose something! I really couldn't think of anything to share with you about repurposing at the moment, but I sure do appreciate the ones you shared here. That bread pan is perfect. Wish I had one. Also loved your screen idea and I use baskets for everything. Glad you are getting things unpacked. What great ideas!! And that was a cool find at the flea market. Esp. at $5.00 a piece. Woohoo!! I use a wrought iron CD rack in my bathroom to hold wash clothes, hand towels and powder and such. 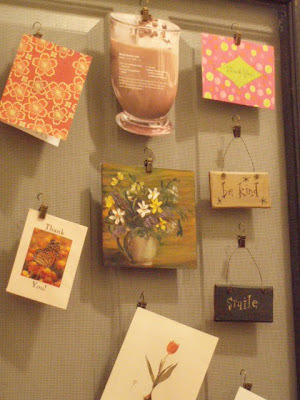 Works great hanging on the wall and keeps things handy! Great easy ideas. Hope you find all your stuff. LOVE easy peasy, and it's basically my main mantra in decorating. I love authentic uses for stuff as opposed to crafting them. Love those ideas, especially the screen! I love easy peasy. What cute ideas. I was looking at your older posts. We have a lot in common. I even have the same picture you have hanging over your mantle. the loaf pans are awesome. Breakfast caddy is as good a use as any. I like the screen idea...but unsure how to use it here in my own home. I'll keep it tucked away in my noggin for later use. Polly, thank you so much for your fabulous contribution to my post today!! I'm sure my readers will love to read it! I like the idea of a practical use for objects in an aesthetically pleasing way..such as your new breakfast station! Hi Polly, I have that loaf pan, I use it for my utensils. Love what you did with it. I have been following your blog for a couple weeks now. I can relate to your adventure. We didn't move as many miles, but when we sold our home, we bought land and no house. We've been building now for 3 years and everything is still in storage! I wanted to stop in to say HI and also to Thank you! 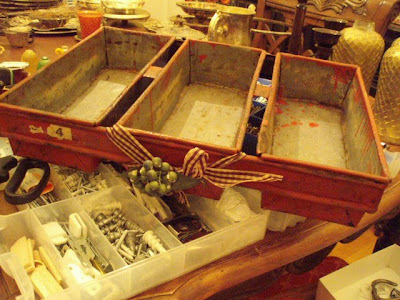 I just spent oddles of hours reading critiques on blogs and the how to's over at Funky Junk Interiors. I actually copied and pasted your comments to word so that I could spend more time learning from them. Thank you for sharing. Look forward to reading more adventures. Hi Polly. I came to visit after reading your great comments on Maria's post about DIY mags and tv and I love it here! Fun tips today and I read around a bit about your move (yikes!) and new home. As a self-taught home sewer myself, I'm looking forward to your pillow tutorials. Maybe I should finally learn how to do things right! Thank you for visiting my blog and taking the time to comment so thoughtfully on my posts..
For now, I just posted a few pictures from her Mehndi ceremony - I will have to put up the rest later iA because of some technical problems. I just love re-purpsoing things. It is my favorite way to craft and create. 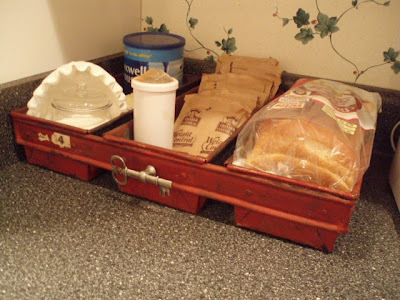 I love the way you transformed the drawer into your breakfast station. It is so unique and works so well in your style of decor. I work in display and the store I work in is always throwing away cool display fixtures. I have acquired quite a collection just waitng for inspiration. Did you check ebay for the pulls. I will keep my eye out for them. I'll have to share a link with you about a use for those small lids. First I should check and see if you have done it already. I love that screen idea. I might have to adopt it. I realize we all have busy lives, and taking the time to comment is not always easy. When you do find that time, it makes me appreciate you even more. If you like what you see or read, feel free to pass on the link to my blog with others. Thank you so much for stopping by! I try to respond to everyone that comments, so if you do not receive a response, it's possible that you are a "No-Reply Comment Blogger" and may not know it, which means I can't find your email addy. Copy and paste this link in your browser to find out how to fix it. Interior Designer turned shop owner, I'm a gal who loves to create pretty and practical fun things. I've done a little bit of everything in my career, and have now come full circle to discover that what I enjoy most in life, I really did learn in kindergarten! The craftiness, that is - the absolute freedom to create with no restrictions whatsoever. Life is good! MakeMineBeautiful and Blackberry House are legally registered trademarks. All information contained within this blog is copyrighted by MakeMineBeautiful/Blackberry House/Polly Blair, 2009-2012. Please ask permission before copying any information. Design by seven thirty three, www.733design.com. Powered by Blogger.